Leaders of charter and autonomous schools in Indianapolis got good news Thursday when Stanford University’s Center for Research on Education Outcomes (CREDO) released a report showing that their students outperformed their peers in traditional district schools — in some instances, significantly. It’s the first academic study of the performance of Indianapolis’s unique Innovation Network Schools, which can be either charter or district schools but have complete, charter-like autonomy over all aspects of academics and operations. The first in a series examining school performance in 10 cities, the report found significant differences in academic growth among charter schools, traditional district-run schools, and Innovation schools. Overall, growth in reading and math among Indianapolis students was weaker than state averages in 2015-16 and 2016-17, the most recent years examined. In 2016-17, Indianapolis students performed below state averages by 24 days in reading and 60 days in math. Within those averages, however, there was wide variation. In the 2016-17 school year, Indianapolis charter school students achieved the equivalent of 77 days more growth in reading and 100 more days in math than students in Indianapolis Public Schools’ traditional district-run schools, who were 48 days behind state averages in reading and 96 days behind in math. Compared with traditional schools, Innovation schools showed the equivalent of 53 additional days of learning in reading and 89 days in math, posting results similar to state averages. The report’s authors describe growth as the equivalent of the number of days of learning gained or lost compared with state averages in order to put their findings, expressed as effect size, in more easily understandable context. Both charter and Innovation schools performed near state averages on most data points. The difference in performance was especially pronounced for black students in charter schools, who gained the equivalent of 65 days of learning in reading and 83 in math compared with peers in traditional district schools. Hispanic charter school students gained 100 days of learning in reading and 94 in math compared with Latinos in traditional IPS schools. English learners, who had lagged significantly in the 2013-14 data, grew the equivalent of 130 days in reading and 106 in math over traditional school students in 2016-17. Low-income charter school students were 71 days ahead in reading and 94 days in math. Students with disabilities did not show significant gains. The study tracked growth in Indianapolis schools from the 2013-14 school year to 2016-17 (with the exception of Innovation schools, for which only two years of data are available) and compared results by school type and student demographics. It also calculated growth in charter schools according to the type of management: by an independent board, an organization that operates three or more schools and holds their charters, or a network of three or more schools that does not hold the charters, the legal documents enabling the schools to exist. In 2016-17, students in the city’s Innovation Network Schools saw overall growth equivalent to the state average in reading. By comparison, Indianapolis charter schools saw growth equivalent to 30 additional days of learning, while traditional IPS schools lost the equivalent of 48 days. The gap in math was even larger. Researchers called the difference for charter schools statistically significant, but not for Innovation schools. A number of the network schools had been chronically underperforming IPS programs that were restarted with the support of an outside partner. Others are new schools, charter schools eager to partner with the district or conversion schools — existing programs seeking the autonomy-for-accountability framework Innovation schools are granted. Researchers might want to compare performance among different types of schools in the network, she added. 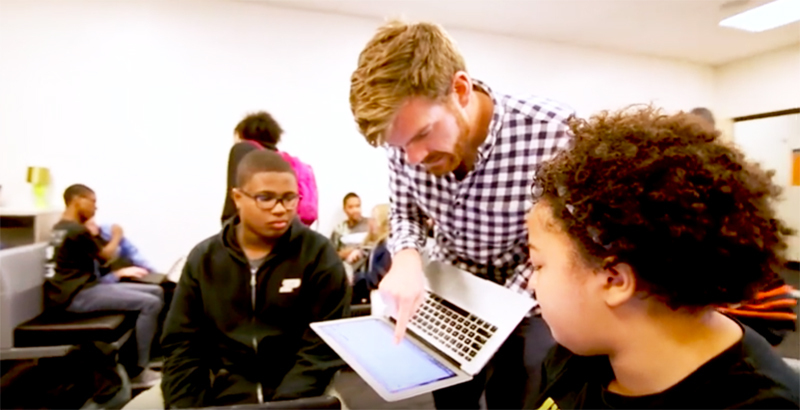 Growth in the previously chronically underperforming Innovation schools was particularly welcome to The Mind Trust, an Indianapolis-based education nonprofit that helped to incubate some of the schools and to recruit and groom their leaders. School turnarounds are notoriously difficult, and past strategies for rebooting troubled schools have seen mixed results. The organization has supported 18 of the 20 schools in the network. Currently, it’s incubating 13 schools slated to open during the next two years. Disclosure: The Mind Trust receives funding from the Walton Family Foundation and Bloomberg Philanthropies.